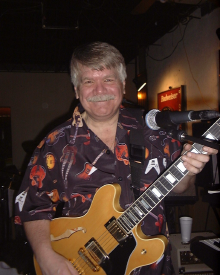 Eddie Becker has been playing in the Washington Metropolitan area since the mid-sixties. Since this time Eddie played extensively in the Washington D.C. club scene during the including the Hayloft Lounge, Rocket Room, Bennie's Rebel Room, Rabbit's Foot, Grog & Tankard, Apple Pie and many other then-famous D.C. night clubs. During this period, Eddie played with a number of horn-based soul groups including the The Spades and Rainbows, The Midnighters and Gerome and the Good Knights. He also played in a rock band with local rock/blues veterans Steve Smith and Wade Mathews before leaving for Texas. Clarence “Oscar Oz” Smith is a native of Washington, D.C. Mr. Smith studied at Jarvis Christian College located in Hawkins, Texas before returning to the Washington area. Oz is a musician, singer and song writer and a former member of the Experience Unlimited and Trouble Funk go-go bands. Oz is currently lead singer and percussionist for the Eddie Becker Blues Band and also performs with Prime Time. Oz has performed with Eddie in the Oz Revue playing in numerous clubs in Montgomery County MD. Oz has performed at local clubs, weddings, private parties and corporate functions throughout the East Coast for over 40 years. Oz has been involved in stage productions and was the musical director and performer in the 1958 production of “The Escape”. This production was presented by The Georgetown Theatre Company. Other theatre productions that Oz has been associated with include “In the Spirit”, “The Razzmatazz Variety Show”, and “The Field Day One Man Show”. Oz performed in “Brer Rabbit” for the Imagination Stage located in Bethesda, MD. Oz has also served as the musical director of church choirs all over the Washington, D.C. area performing at their special events. Waverly Milor has been singing since he could talk and playing harmonica for about 8 years. He can be seen around the DC area fronting the ACME Blues Company, sitting in playing harp for Blues On Board, singer/songwriters David Morreale, Michelle Swan and others. You can also find him at nearly every DC Blues Society event. Wave is an admitted blues jam junkie and has played in such places as North Carolina, Tennessee, Oregon, and Copenhagen, Denmark. In October 2005, Wave had the great honor to perform with Richard Johnston and John-Alex Mason at the 25th Annual King Biscuit Blues Festival in West Helena, Arkansas. Sam is one of the hardest working musicians playing the Washington, DC music scene. In addition to playing with the Eddie Becker Band, Sam plays with the Melanie Mason band and Honky Tonk Confidential - often featuring Bob Schiefer of CBS News, Face the Nation. Sam's versatility and exceptional chops have provided the opportunity to play on stages like the Kennedy Center for the Performing Arts and Washington, DC's Blues Alley. Thomas Cox, bassist, plays mostly on the east coast, where he is is known in many blues clubs and watering holes as "Hamfat." For years, he played Baltimore's infamous Block at night, and performed in church and gospel choirs during the day. A strong proponent of the Bert Kaempfert school of bass playing, Hamfat studied under the guidance of Jumpin' Jim Doherty. He later formed partnerships with Leo Kite and the late Harvey Lipps to create the little known but influential "Silver Spring Sound," which gained popularity in radio advertising during the mid 1970's. Scot grew up in Columbus, a small town outside of the hotbed of liberalism, Madison, Wisconsin. He learned to play the drums through the public school system and was playing in Madison area clubs at 16. At 18 Scot moved to Chicago where he played in several rock bands and quickly became friends with, was taught by and later played in bands with, the same musicians who regularly back some of the best Blues bands in the world - Lonnie Brooks, Elvin Bishop, Byther Smith, the late Paul Butterfield, the late Son Seals and others. In 1986 Scot moved to the Washington, DC area where he has since played regularly with rock, blues, soul, country and contemporary Christian worship bands throughout the area. Scot has played drums for Eddie Becker since his arrival to the DC area in 1986. Most memorable performances include opening for The Little River Band, Johnny Winter and playing a side stage at the MCI Center at a Reba McIntyre/Brooks & Dunn concert. Tony Bardo finds the funk and R&B sounds of the Eddie Becker Blues Band a fun change from his roots as a classic rock and acoustic musician. Tony has played in bands since the 8th grade ranging from Top 40 rock to folk, to horns and back to classic rock in his over 40 years in music. Highlights include warm up acts for the Charlie Byrd Trio and Goose Creek Symphony with his acoustic trio, Greely Vic & Louis, and playing at both the House of Blues in New Orleans and the Hard Rock Live in Orlando with his classic rock band, the Fabulous Dialtones. Tony would like to thank his mother for forcing him to practice his piano at a young age, when he would have rather been kicking a soccer ball, and his many friends who helped him learn to play the guitar once he discovered that guitar players got all the girls. Gil Wilshire divides his time between music, family raising, doctoring, and business development. Although he is a professional musician at heart, he is also a pragmatist who likes to be able to pay his bills while investing in new trumpets. Gil has played the trumpet and related brass instruments for over 35 years. He has studied with such trumpet luminaries as Jerome Callet, Leonard Goines, Vaughn Nark, Chuck Ohman, and John Blount. In college he had the opportunities to play with trumpet legends such as Woody Shaw and Ted Curson. He has played along in his basement with recordings of influential bands from leaders such as Maynard Ferguson, Freddie Hubbard, "Hannibal" Marvin Peterson, Earth Wind & Fire, and Chick Corea. His most prize possession is a trumpet mute signed by Arturo Sandoval, Doc Severinsen, Wynton Marsalis, Maynard Ferguson, Vaughn Nark, and Vince DiMartino. Gil has recently moved his family to Missouri to further his day-job profession as a Doctor. Gil intends to maintain his connection to the band. We look forward to the day when he is back up on stage with us giving it his all - as he always does! As of today Tim is the newest member of the band - and we are fortunate to have him. Tim graduated from Edinboro University of Pennsylvania in 1985. Upon graduation Tim enlisted in the U.S. Army where he played trumpet in his fight for good music. Tim was stationed in the Washington, DC area throughout his Army career - retiring in 2005. Tim is a family man with his own army of children. At present Tim teaches, plays in several DC area bands as well as being on-call to fill in as a sub for too many bands to mention. Trombonist Brian Priebe recently returned from his third national engagement with the String of Pearls Orchestra's "In the Mood Live" tour. As a freelance trombonist he has appeared with such luminaries as Connie Francis, Doc Severinsen, Franki Vali, Della Reese, Carole Channing, Louis Bellson, Clark Terry, and The Moody Blues. Before moving to the Washington, DC area, he worked for 8 years with the Utah Chamber Orchestra and taught music at Westminster College of Salt Lake City. The sound of his horn can be heard on numerous movie and TV soundtracks and commercials. Brian is currently working as a freelance trombonist in the Washington/Baltimore area playing styles ranging from dixieland jazz to disco and R&B to classical and chamber music. Recently, he recorded the radio theme song to National Public Radio's news program, "Day to Day". Hollywood began his musical journey in 1964 playing the clarinet. After 10 years of practicing and playing the clarinet Hollywood went over to the saxophone. Hollywood is now celebrating his 40th year in music now and has played with many distinguished musicians in the Navy Band and the Washington, D.C. area. Hollywood has focused on the tenor saxophone as this the most widely used horn in all of contemporary music as crosses many genres including jazz, funk, R&B, country, and rock 'n' roll. Hollywood uses a Selmer Mark VI, made in 1972. Hollywood today is celebrating his 31st year of professionally playing. He is still learning jazz which he considers is a never-ending science because there's always a new dimension of it coming out. Hollywood knows that you've got to be on your toes playing jazz and with the friends of Eddie Becker. Dan Mack has been playing saxophone for over 25 years. He studied music at Indiana University of PA, the New School in New York City and the Eastman School of Music in Rochester. Dan plays Alto, Tenor and Bari and can plays both classical and jazz. Dan has played with a variety of local groups in the Washington D.C. area through the last 6 years. Dan presently is a part of the Beltway Horns which he plays Baritone and Alto Saxophone. Dan’s musical influence includes Tower of Power, James Brown, Jackie Mclean, Paul Desmond, and Grover Washington Jr.